My love, please come down from the mountains, and remember to bring your horse and come alone. Though I am no longer beautiful, I have an umbrella to hide us from the sunlight on our way to the love market. VANG THI MI is quite excited as she weaves a nice brocade dress. She is preparing for a date. Not with her husband though - with her ex-boyfriend. Her husband knows all about it and there is no issue at all, as he also has a date lined up with his ex-girlfriend. They are not estranged and are still very much in love. And they’re not just looking for some “exploration” either. Both are attending a special festival that allows them to be free to be with their ex for one night. Living in Lung Pu commune in Meo Vac district, Ha Giang province in the northern mountains about 500 km from Hanoi, Mi and her husband have never missed the Khau Vai Festival since getting married a few years ago. Every year, hand-in-hand, they walk over hills and mountains and along streams to Khau Vai commune in Meo Vac, where the festival takes place. Organized annually on the 26th and 27th of the third lunar month (April 30 and May 1 this year), every year the Khau Vai Festival welcomes thousands of visitors from different places to see either their previous partners or just enjoy the unique traditions of local ethnic minority people such as the Tay, Nung, H’mong, Giay, Lo Lo, Dao, and others. The Khau Vai Festival is also known colloquially and perhaps unfairly as the “Love Affair Market”. It is believed to have first taken hold in the early 20th century and originates from a legend. There was a man from the Nung minority and a woman from the Giay minority who fell in love, but both families were in opposition to any talk of marriage as people from different groups just didn’t do so. So they escaped, living together in a cave on Khau Vai Mountain. But they weren’t happy for long, as from their cave they could see fierce battles erupting between their two peoples because of their love. Unlike Romeo and Juliet, they decided to break up and go home, sacrificing their love for peace. They promised, though, to return to the mountain every year on the day they broke up. Touched by their sacrifice, local people set up a temple to worship them after they passed away and then started a festival every year to commemorate their love. Khau Vai is not the only such festival in Vietnam. Other places also have different festivals with the opportunity for exes to see each other again. The Xuan Duong Festival of the Tay and Nung people in Xuan Duong commune in Na Ri district, northern mountainous Bac Kan province, began no one knows when after a wife was kidnapped and her husband couldn’t find her. Years later, they met again by chance at a festival. They still had feelings for each other, but could not get together because each had a new family. Their story was heard all around the local mountains, and local people agreed that the day they met again, on the 25th day of the third lunar month (April 29 this year), would become a festival day for others who didn’t end up with their first true love. Meanwhile, the Drum Festival, held on the 16th of the first lunar month (February 20 this year) by the Ma Coong ethnic minority group in Thuong Trach commune in Bo Trach district, central Quang Binh province, is organized annually to honor Giang (God), who helped local people use a drum to kill a monkey monster that was destroying their crops. Though unsuccessful, Giang granted them an evening of celebration with free love and no restrictions or rules. These festivals became a venue for “social dates” between exes, with many eager to participate as the day approaches. It’s the one day of the year they can meet and visit places where they once shared their love. Here and there, people, shoulder-by-shoulder, hand-in-hand, enjoy each other’s company, drink rice wine, sing traditional songs, and share what’s happened over the last year. Daily life is forgotten, and everyone is in the moment. 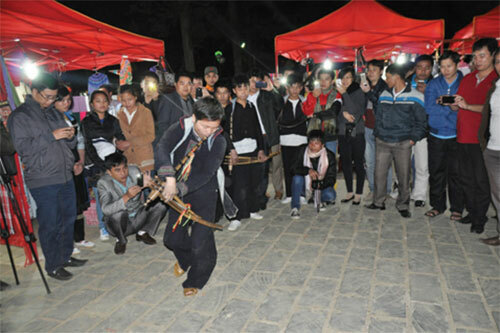 Organized annually on the 26th and 27th of the third lunar month (April 30 and May 1 this year), every year the Khau Vai Festival welcomes thousands of visitors from different places. Not everyone has a good time at these festivals, though, and for a few it’s a sad experience. Some try to find their ex but can’t. Others come back on a promise, but their ex might be busy or simply can’t come. Some beverage shop owners in Khau Vai commune told local media about people like 80-year-old Lau Minh Pao from Quan Ba district in Ha Giang, who has attended some 50 Khau Vai Festivals and met up with his ex every time, but last year, when she didn’t show up, he knew she had passed away. He decided to still go to the festival this year, to recall all the special memories they had and “officially” say goodbye. Honoring love, these festivals are no longer just for couples who parted ways but also for lovers to have a nice date or for young people to find love. It’s also an opportunity for women to dress up and for men to show their talent on traditional instruments and flirt and have fun. Some couples met at these festivals and went on to get married, returning to celebrate destiny. Like other festivals, these also feature a range of cultural activities such as ritual ceremonies, traditional singing and dance, and folk games. Special dishes of different ethnic minority groups are also on offer. The whole thing creates a colorfully-vibrant festive atmosphere with a lot of love.